Recipients such as Duke Hobbs, center, learned of the honor in surprise announcements that featured A&M leaders and dignitaries. Four Brazos County Aggies are among Texas A&M's Distinguished Alumni of 2018. They will be honored at a gala event Oct. 5 and at halftime of the Aggie football game the next day. Read more about them and their accomplishments below. Earlier this year, they learned the news in surprise announcements that were conducted by university leaders and featured a member of the Ross Volunteers reading a special proclamation. You can see photos of these surprise announcements at photos.aggienetwork.com/Distinguished-Alumni and view all 10 of the 2018 recipients at tx.ag/DA2018. Since the inception of the award in 1962, only 281 of Texas A&M’s 488,500 former students have been recognized with the Distinguished Alumnus Award. 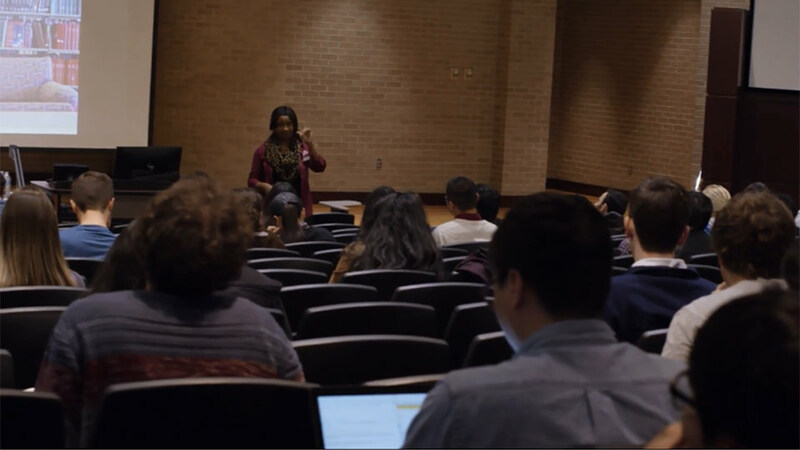 Awarded jointly by the university and The Association, this honor recognizes those Aggies who have achieved excellence in their chosen professions and made meaningful contributions to Texas A&M University and their local communities. The recipients learned of their honor when surprised in their places of business and other locations by university and Association representatives, including Young, The Association of Former Students’ 2018 Chair of the Board of Directors Jimmy Williams ’83, Ph.D., Association President and CEO Porter S. Garner III ’79, Texas A&M Foundation President Tyson Voelkel ’96, and a Ross Volunteer, along with university mascot Reveille IX and her handler. Garner echoed the sentiments of Young and Williams and offered his congratulations on behalf of The Association of Former Students. The Association of Former Students will further honor all recipients of this award during its annual Distinguished Alumni Gala on Oct. 5. In addition, the 2018 recipients will be recognized during the Oct. 6 Texas A&M football game against Kentucky. Nominations for the 2019 Distinguished Alumnus Award will be accepted through Oct. 7 at tx.ag/DAnominations. 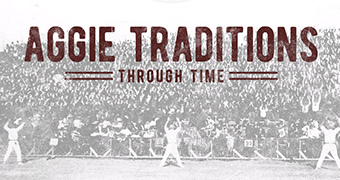 The Association of Former Students, established in 1879, is the official alumni organization of Texas A&M University. 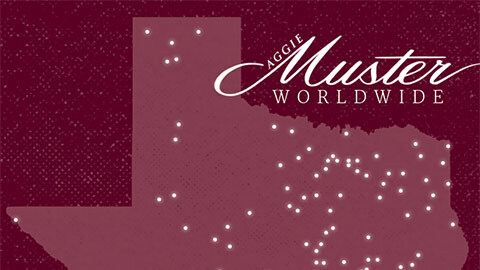 The Association connects hundreds of thousands of members of the worldwide Aggie Network with each other and the university, and provided $12.6 million in impact to university scholarships, awards, activities and enrichment for students, faculty, staff and former students in 2017. For more information about the Distinguished Alumnus Award or The Association, contact Kathryn Greenwade at KGreenwade88@aggienetwork.com or visit www.AggieNetwork.com. L.D. (Duke) Hobbs ’47 was a 314th Infantry sergeant in World War II, earning the Bronze Star and Purple Heart. After returning to A&M to finish his degree, he served as an Air Force intelligence officer in the Korean War. He worked for Procter & Gamble Co., then W.L. Gordon Co. merchandise brokers, where as vice president he was responsible for growing one of the largest non-food organizations in the industry. Upon retiring, he came back to A&M to teach management and direct the Center for Executive Development. 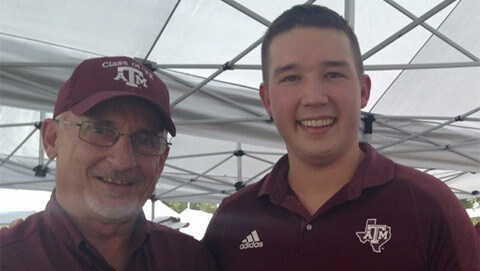 He served for more than 20 years as a Class Agent for the Class of ’47 and has been a Fish Camp namesake. Proceeds from his book “I Knew I Was an Aggie When” support Texas A&M’s Cushing Memorial Library. He has been congregation vice president at Our Savior Lutheran Church in College Station; an Eagle Scout, Scoutmaster, merit badge counselor and Boy Scouts of America regional director; a Republican National Convention delegate, election judge and county chair for regional development. Jim Singleton '66 has practiced architecture for over 40 years, specializing in educational facilities for over 100 districts in Texas with more than 300 K-12 projects; his work also includes medical buildings, banks, office buildings, athletic centers and pro bono work including the Brazos Valley African American Museum and Bryan’s Queen Theater. Singleton, a Distinguished Military Graduate of A&M, was a U.S. Army scout helicopter pilot in Vietnam. In 2002, he was inducted into the A&M Lettermen’s Hall of Honor for his leadership in completing the original A&M Sports Museum. In 2012, he was named an Outstanding Alumnus of A&M’s College of Architecture. In 2015, he was elevated to the College of Fellows of the American Institute of Architects. He has mentored dozens of aspiring Aggie architects and in 2016 established the James M. Singleton IV ’66 FAIA Educational Architecture Professorship at A&M. He has served on boards for the Brazos Valley Veterans Memorial, Boys and Girls Club of the Brazos Valley and Brazos Valley Symphony Society. Eddie Joe Davis ’67 served as president of the Texas A&M Foundation for 23 years, 1993-2016, leading three major fundraising campaigns that brought more than $2 billion in support to A&M. He also served as Texas A&M University’s interim president 2006-08, following Bob Gates’ appointment as U.S. secretary of defense. Davis was a U.S. Army paratrooper in Vietnam, and before joining the Foundation, held every key financial position, including CFO, at Texas A&M and The Texas A&M University System, finally serving as executive deputy chancellor of the System. In 2012, he received the National Commonfund Institutionally Related Foundation Award from the Council for Advancement in Support of Education. His service to others also includes being on the Bryan-College Station Chamber of Commerce board, vice chair of the College Station Development Foundation, a member of the Governance Committee of the CHI St. Joseph Hospital System and many others. He and his wife co-chair the $20 million campaign to build a new church for St. Mary’s Catholic Center in College Station. John S. Sharp '72 served Texas for more than three decades in public offices before being appointed chancellor of The Texas A&M University System in 2011. As chancellor, he leads one of the largest systems of higher education in the nation, a statewide network of 11 universities and seven state agencies, with a budget of $4.7 billion. Prior to becoming chancellor, Sharp represented Victoria in the state House of Representatives 1979-83; served as a state senator 1983-87; was Texas’ railroad commissioner 1987-91, then state comptroller 1991-99. After working as a principal at tax-consulting firm Ryan LLC, he was appointed head of the state Tax Reform Commission in 2005. In 2017, the State of Texas tapped him to lead the Governor’s Commission to Rebuild Texas post-Hurricane Harvey. Sharp was student body president and a member of the Corps at Texas A&M and served as a second lieutenant in the U.S. Army Reserves.